I finally got the strawberry types straight, and found out the kind I want in my garden - "day neutrals." That's the name of strawberries that keep giving berries all season. Their name comes from them not taking cues from the length of sunlight, which triggers other varieties. 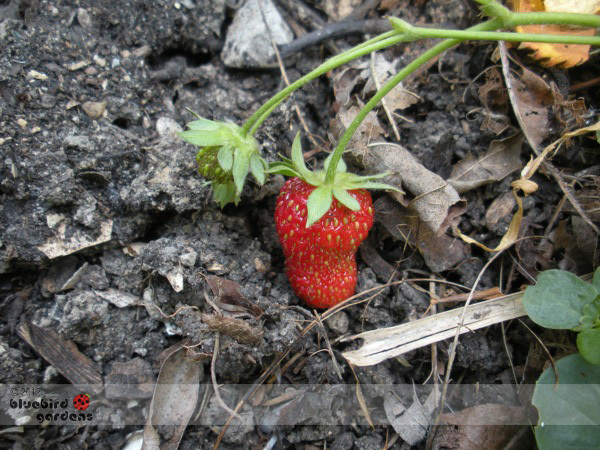 Not to be confused with "everbearing strawberries," which really provide fruit only a couple of times during their growing season, once in June, then again early fall. Regular strawberries fruit once, maybe twice, in June. Besides frequency of fruit, day neutral strawberries tend to be smaller than new strawberry hybrids but they make it up in delicious, continuous fruiting!